Sometimes good comes from bad, as evidenced by this stunning ’55 Two-Ten. As a teenager growing up, I was always around cars. My daddy was a car salesman and one of my uncles ran a junkyard. Through the years, I had a ’56, ’57, and ’58 Chevy. I always wanted a ’55, but never had one. 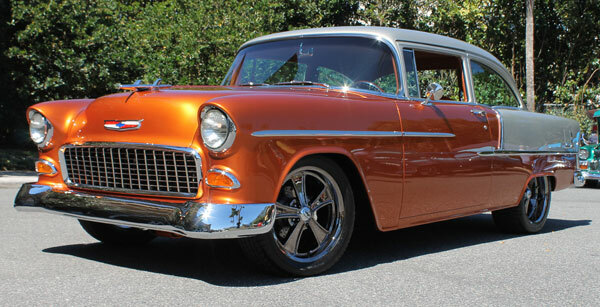 When I retired in 2010, I sort of got serious in my desire to have a ’55 Chevy. I was at a car show with my ’36 Chevy street rod one day where I met a man who was driving a nice ’55. He told me that he had another one at home that he might be willing to part with. I had already been doing some talking with my friend Victor Pille and his son, Austin about building a ’55. Victor worked for a Chevy dealership, plus he had a shop at his home where he had restored several other cars for himself and other people. I had gone down and taken photos of the ’55 that was for sale – it was rough, but not beyond a restoration. Well, even though my wife said “no way”, I bought the car anyways and it went to Victor’s shop for the work to begin. It took 2-1/2 years, but it came out nice – you might say it came out too nice. My wife and I were with some friends at a show in Newport, TN on June 21st, 2014 when the car was stolen from the motel parking lot in the middle of the night. It was painted orange and white, which are the Tennessee colors. Talk about sick? It tore us up! 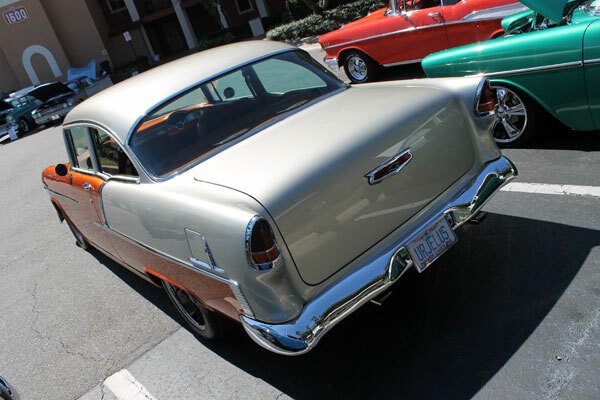 But we decided that we would use the insurance claim money and get ourselves another ’55. We were watching a Barrett-Jackson auction on TV when they ran a Corvette across the block. My wife loved the paint color. “That’s the color we want!”, she said. I looked online, found the color and the process began for “The Replacement”. The body had to be pulled back off the frame, the engine removed, transmission, brake assembly, etc., so they could all be painted Atomic orange (to suit my wife). We also needed to pick a contrast for the two-tone, which wound up being Silver Champagne, thanks to Travis Kiel in Dan’s shop. The next step was the interior design and colors. I stepped aside and turned the wife loose. 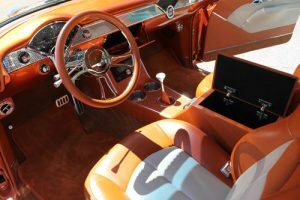 Dan Wickett pulled out samples of headliner, seats, door panels and carpet which he thought would blend well and “tie it all in” with the paint. Things were going well until October 30th, 2014 when I suffered a cardiac arrest. Medics had to shock me with a defibrillator seven times to bring me back to life. After several weeks in the ICU, I was finally responsive enough to ask what was going on with the car. Well, my good friend Victor Pille had talked with my wife regarding the car while I was unresponsive and on the ventilator. Victor suggested, “How about if you just let me sort of take over and let’s keep Dan working on the car.” If it were not for Victor, this car probably would not be on the road today. He has done a list of work on mechanical issues since we brought it home. This is a “driven” car, not trailered. Some of the participants and spectators thought we had been placed in the wrong class at Chevy Classics’ Winter National. We traveled with our friends to Bowling Green, KY last August for the Tri-Five Nationals and now Colin Date has found us with our friends again here in Orlando, FL. I am running an LS-1 engine with a small cam. 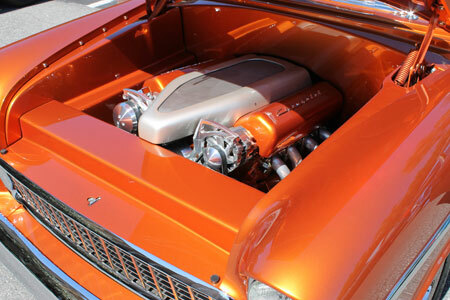 On the dyno she turned 340 horsepower at the rear wheels with a 4L60E transmission and 3.73 gear rear end. 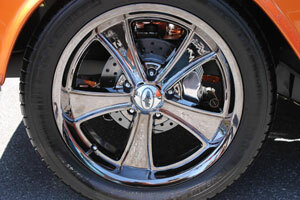 The car is equipped with a Wilwood 4 wheel disc brake system with Hydroboost. She runs on Michelin tires and Coy C-57 black chrome wheels – 18×7 on front and 18×9.5 out back. Our car has a custom ultra leather interior with power bucket seats and a center console with a Lokar shifter, Kenwood stereo, Vintage Air controls and power window switches. We were thrilled to have been awarded the 1st place Custom ’55 with 996 points. We hope to be back to the Eckler’s Winter National next year and have many more shows lined up between now and then.